Santa Barbara, CA. 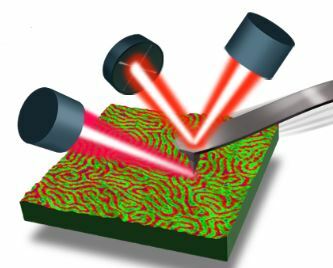 – January 31st, 2017 – Anasys Instruments, the world leader in nanoscale IR spectroscopy, announces the release of Tapping AFM-IR, which provides sub 10 nm spatial resolution and monolayer sensitivity for nanoscale Infrared spectroscopy. The Tapping AFM-IR capability combines Anasys’ patented Resonance Enhanced AFM-IR technology with AFM based tapping or AC mode operation. This new patent pending technology provides researchers and industrial users alike the ability to quickly and easily identify chemical components to sub 10 nm spatial resolution on a wide array of samples down to monolayer thickness. The AFM-IR technique pioneered by Anasys enables nanoscale FTIR via a spatial resolution breakthrough of close to three orders of magnitude. Unlike other AFM based spectroscopy techniques such as TERS, the AFM-IR technique is a robust technique that has been adopted by academic and industrial researchers worldwide to solve important problems in a broad range of applications, from Life Sciences to Polymers to Materials Sciences. The Tapping AFM-IR mode is available on the new nanoIR2–s™ and nanoIR2–FS™ products alongside FASTspectra™, which enables nanoscale IR spectra measurements within seconds. Learn more about Tapping AFM-IR here. To learn more about the nanoIR2–FS, visit the product page here. Anasys Instruments and our scientific collaborators pioneered the field of nanoscale infrared absorption spectroscopy and imaging. Our team is focused on providing robust nanoscale chemical spectroscopy and analysis. With a researcher’s productivity always in mind, we deliver integrated hardware and software solutions that clear the path to your next discovery. Nanoscale IR spectroscopy is complemented with techniques such mechanical, thermal, and electrical analysis to provide unique multi-modal capabilities. The nanoIR2-FS is the latest generation nanoscale IR spectroscopy, chemical imaging and property mapping system for both materials science and life science applications. The new system provides spectroscopic capabilities that provide excellent correlation to FTIR transmission spectra on a wide range of material types enabling nanoscale FTIR measurement. The system also provides IR based chemical imaging to provide mapping of chemical variations of the feature of interest. Unique Point Spectroscopy capabilities provide both spectroscopy and chemical imaging with a single source. An integrated AFM provides unique property mapping capabilities with thermal, mechanical and electrical modes to support unique multi-modal characterization of a wide range of materials science and life science applications. The nanoIR2-FS is built with ease of use and user productivity in mind with many automation features reducing the need for user set up and complex laser and optical alignment procedures.